flora and fauna in the 03 national parks Ambre, Ankarana and Sahamalaza. the Nord makes your stay exceptional. Reception at the airport, arrival of the flight from Antananarivo and transfer to your hotel. Departure for the visit of 03 bays of Sakalava bay, pigeon and dune through the Baobab endemic to the entrance of Nosy Ravo. Walking, relaxing and sunbathing along the beaches. recovery of the car through a trail through a dry forest flamboyant and Baobab opens to the place of business lighthouse and guns remains and military installations across the passes of the Bay of Diego. Lunch in the village of Ramena fishing and the afternoon will be devoted to Swimming contemplating the sunset. 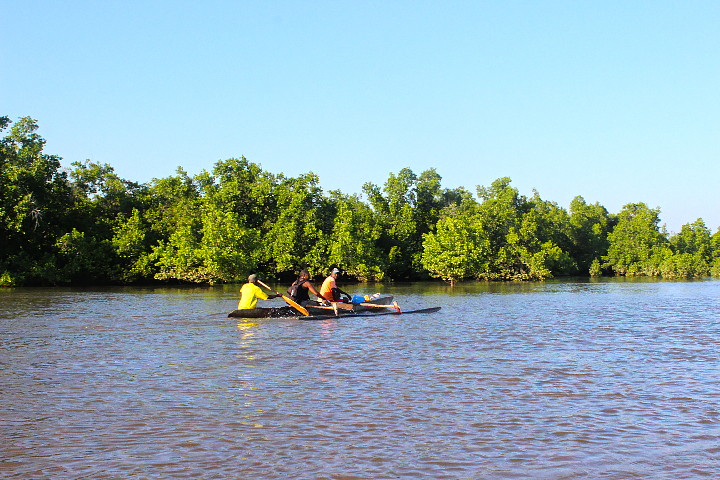 Overnight in Diego Suarez or in hotels ecolodge in Ramena. Departure by car through Joffre village to visit the Mountain National Park Amber, it consists of a primary rainforest, known for its wealth in water / waterfall that feeds the entire city of Diego Suarez. It is also the birthplace of reptiles, amphibians, birds, some lemurs. Descent to visit Joffre village, with a clear and impressive views of the Diego bays exchange with the population. Overnight at logde Joffre city. 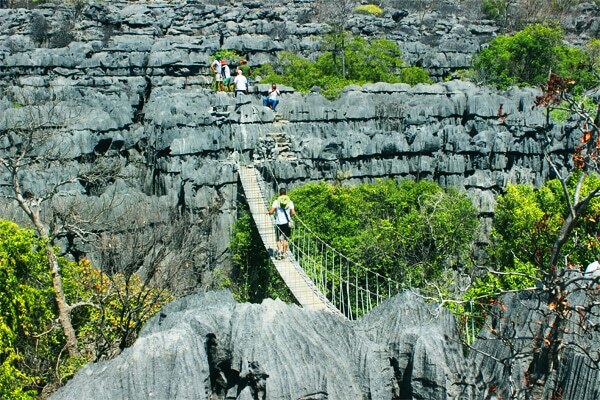 Departure to discover the Red Tsingy through the special reserve Analamera near the village of Irodo through the aisles of Satrana. A 62 km from Diego, Red Tsingy are specific and very fascinating. They are made of sandstone, marl and limestone, right at the feet of great canyons carved by erosion and gives beautiful colors, from red to ocher through white and pink. After the tour, we travel to the village of Antagnavo, Anivorano to discover the sacred lake, and myth. Inhabited by sacred crocodiles, specific form, according to history, these crocodiles were human, villager but cursed by an old person passing Antemoro for having refused to give him water to drink. The curse hit the village, it was flooded and changed into large lake and the villagers were turned into crocodiles. After this discovery, join ankarana year to spend a quiet night in your lodge. Visit the National Park of Ankarana, which consists of an extended on 18220 ha topped limestone formation Tsingy sharp, with caves of Aven or pit and dry forest. The park is populated unique species in the world, adapted to drought or darkness: the lepilemurs, lemurs, reptiles and amphibians, birds. To have more time for endémque cash, your overnight stay will be at logde in Ankarana. Early morning departure for Ambanja, to discover the excellent quality cocoa plantations deemed the world. After you check into your hotel or guest house to half of the morning, a community site ambobaka, instead of traditional healers Malagasy will be visited. With crossed by canoe 20 minutes from Lelong balance of the river, you access the good father cascade or swim under the waterfall and natural pool makes them unforgettable holidays. Early departure in jeep to Antafiabe to discover lemurs in Turks eyes, or “flavifrons” local endemic, they are found only on these places and return to Antsohihy at the end of the day. City Tour for the morning. Discover satrana (latanier genre) and visit the handicraft who transformed them into decorative items. And then followed by the visit of the relics of the first republic with their hidden histories. Morning departure in 4×4 to Bealanana, to a specific destination, Bemanevika Special Reserve to find the local endemic fauna such as wild duck with white eyes (Aythia inotata) and red owl. Exchange and immersion with the local population. Small morning hiking to discover the hidden treasure of the reserve, to meet with local endemic fauna and especially the species found, classified extinct, Canvasback Bemanevika Bealanana. Exchange and immersion with the local population. Departure to Ankify and star Transfer to your hotel ecolodge in Nosy Komba. Visit Nosy Komba, the special reserve that this home to Macaco lemurs, and other protected species since they are considered sacred. Discoveries reptiles and other species. You can choose also to the acquisitions of souvenir items among other embroidery, sculpture or fine wood, carved stone etc. Featured Departure to Nosy Tanikely the Nosy be marine reserve, it is the most visited of the archipelago, thanks to various fish multi color, coral and marine turtles, it is ranked among the most beautiful diving sites in region. After all that out, back to the hotel around noon. Featured transfer to Nosy Be, for the discovery of the island Nosy Be. After settling into your hotel. Tours and 4-4 excursion around the island is in the program. The discovery of extractions Ylang Ylang and visit and a share of flora and fauna, visiting Oceanographic Centre, the 03 sacred lakes and the Belvedere, a magnificent 360-degree view of the island in Mont Passot.